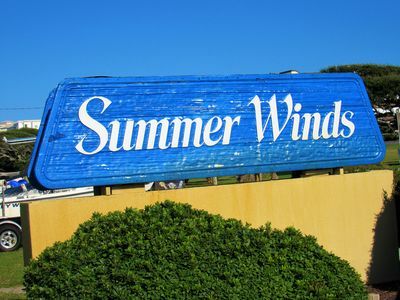 Think Warm Summer Breezes! 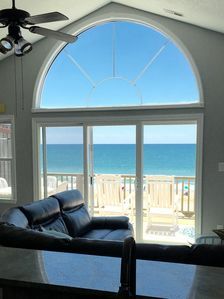 Oceanfront Home- Summer Weeks 2019 Still Available! Debby Mallette shared a video on Vigo, come check it out! 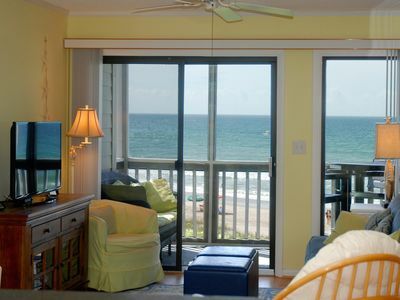 Our oceanfront home is a sanctuary-a place to relax, unwind, and rejuvenate. 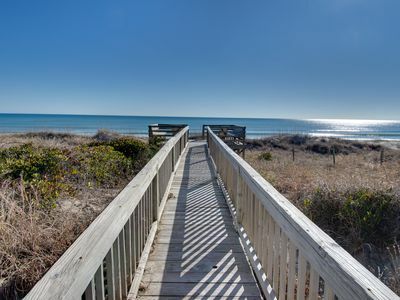 No better way to start your day than to listen to the waves & feel the ocean breezes! 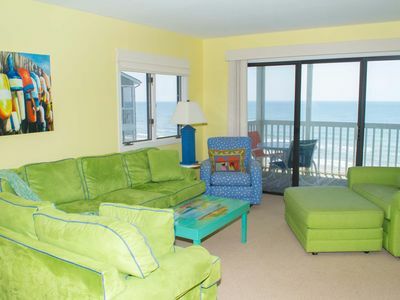 Each room has been uniquely styled in cool calming colors-Nothing takes away from the Atlantic ocean with all its ever changing colors of ocean & sky! Our home is set up with a reverse floor plan to maximize the view-triple deck doors, windows & bay window allow views from many sides. The main living area on the top floor includes the comfy sectional sofa with recliners, dining area for 8 plus 4 at the kitchen bar, and fully equipped kitchen with beautiful copper apron sink & granite countertops. A queen bedroom with ocean view & bath with granite vanity & copper sink plus tub/shower combo are on this floor too. 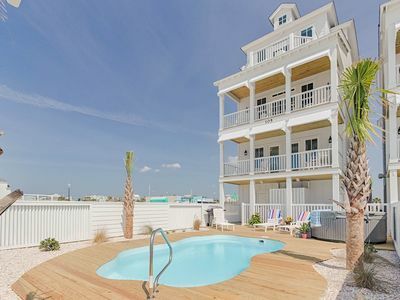 The middle floor hosts the oceanfront master bedroom with en suite bath complete with Jacuzzi tub, separate shower, double granite vanity with copper sinks. There are 2 other bedrooms on this floor-one with twin beds and another with a queen bed. Each bedroom has an ocean view. Another bath is on this floor with granite vanity & copper sink plus tub/shower combo. 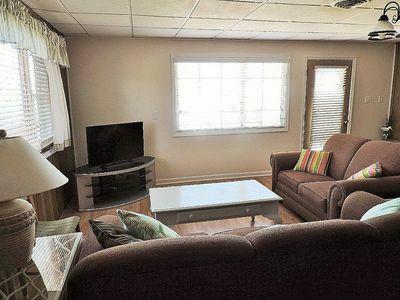 The first floor has our welcoming foyer, high efficiency washer & dryer in its own closet and fifth bedroom with single bed & double sleeper sofa. 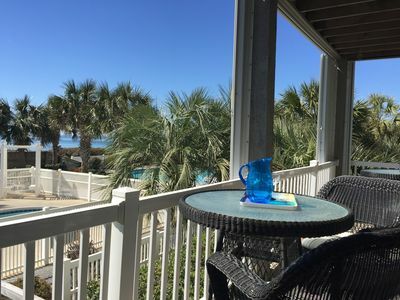 Each of our two oceanfront decks has a dining table with 4 chairs. 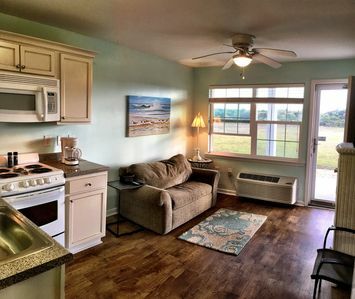 The top deck outside the main living area also has 2 rockers & 2 lounge chair plus an umbrella for the dining area. 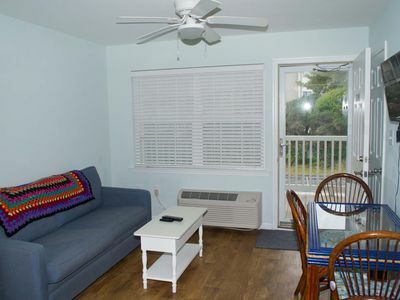 The second deck outside the oceanfront master bedroom also has a wonderful rocker to sit in and watch the waves & feel the ocean breezes-so cozy! Since we are a duplex, we have designated parking for 4-5 cars (one car garage). 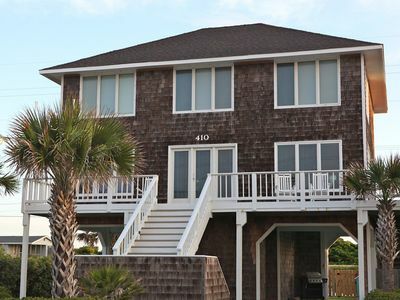 Charcoal grill, beach chairs, & kids' beach toys are stored here for your use as well. Each bedroom has a flat screen satellite TV. The main living area has a 46" satellite TV & VCR/DVD player. We also have Netflix & Amazon available for our guests as well. Free WiFi is installed for your use too. 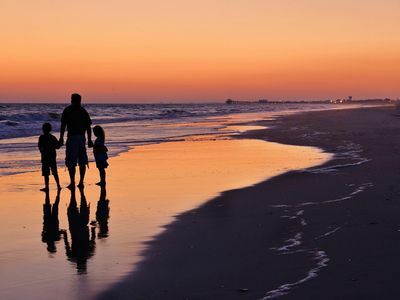 We are located directly on the Atlantic Ocean with spectacular views of sunrises in the east and sunsets in the west. No Wake Zone West provides all the needed amenities plus those that only God can provide . . . again the sunrises and sunsets, the smell of the salt air, gorgeous waves, soft sand, pelican fly-overs, and the bountiful and unique shells that wash up on shore. Every time of the year is special and there is no bad day at the beach. We've enjoyed the strong winds and powerful waves during tropical storms, the awesome hot days of summer, and the relaxing cool days of autumn. The mere sound of the ocean waves brings a calmness to weary travelers. 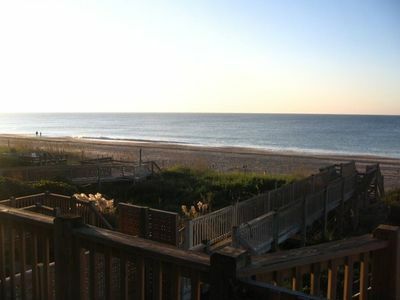 It's nice to go to sleep and wake up to the steady rhythm of the Atlantic Ocean. 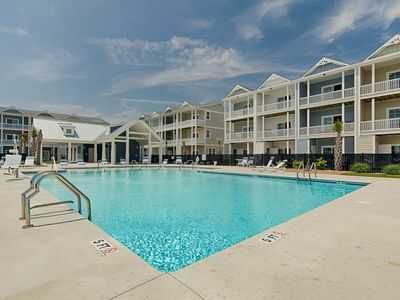 Within Walking Distance of Restaurants, Ice Cream, Mini-Golf, Shopping, Bike & Kayak Rentals, Fishing Pier. 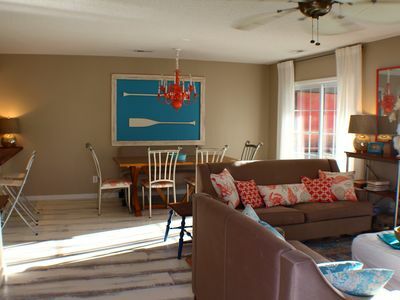 We have been a part of the HomeAway rental program since 2010. We are a VRBO Premier Partner & part of the 'Instant Booking' Program to help make your payment schedule easy! 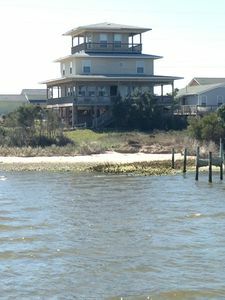 Charley & I have enjoyed Emerald Isle for many years. It's always been a retreat for us-to relax and to just focus on the truly important things in life. We invite you to do the same . 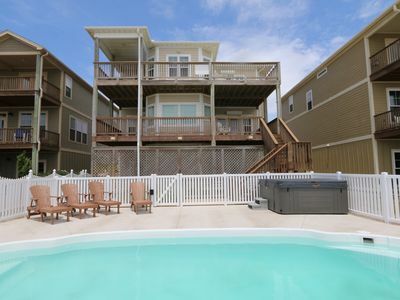 . .
Beautiful 2nd Row Cottage with Pool!! 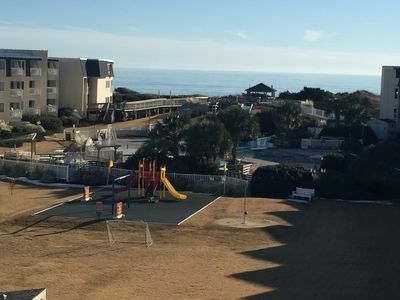 Beach Front Condo, 150' Waterslide, Tennis, Mini Golf and More, all included. 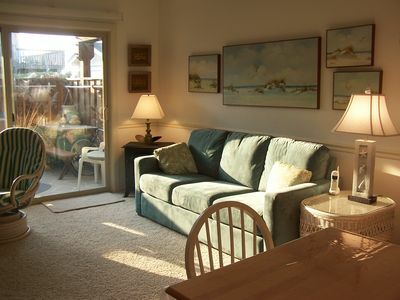 Tastefully Decorated 3rd Floor Oceanfront Condo! Great Views! Beach Chic In Atlantic Beach! 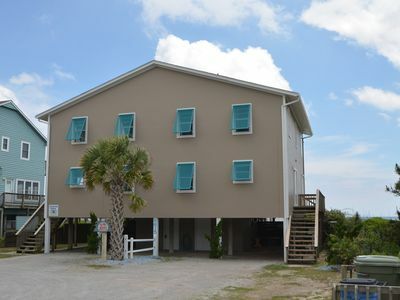 - Fully Renovated Ocean Front Condo With Pool!! Oceanfront Ocean Club 103C "Salty C". Heated YR oceanfront pool. Beach supplies. Relax in the lap of luxury! 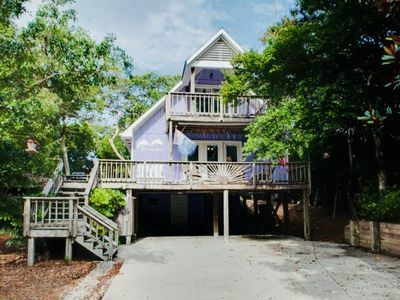 Direct oceanfront, private pool, beach charm!